In certain areas of the United Kingdom, a strange sight awaits those who take a moment to look around. 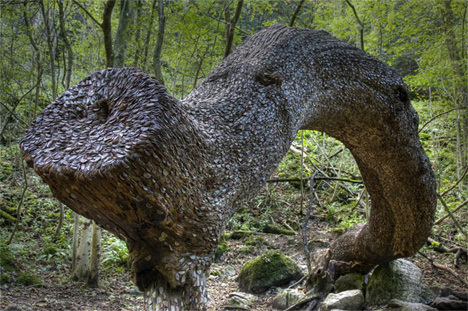 Trees – both living, growing trees and felled trunks – covered in coins dot the landscape. 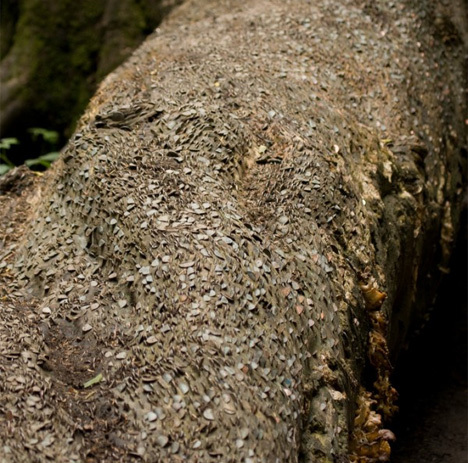 Passers-by hammer the money into the trees with rocks they find nearby, leaving a long-term mark of their passing. But what is behind this odd tradition? According to BBC News, the “money trees” are examples of wishing trees. Ever since humans developed spiritual beliefs, they have been making offerings to – and asking for favors from – the spirits of nature. By giving small trinkets, food, beverages or other items to certain trees, it is said that the spirits which inhabit the trees can grant wishes. The money trees may be utilized by people plagued by an illness. One legend says that by hammering a coin into a tree, the tree can take away the sickness. Anyone who dared to remove one of the coins would himself be stricken with illness. Could all of these coins really have been placed by individuals trying to rid themselves of diseases? Or is the presence of the coins a bit less dramatic? Maybe these “gifts” are akin to tossing pennies into a wishing well, making a silent wish and hoping that it comes true. 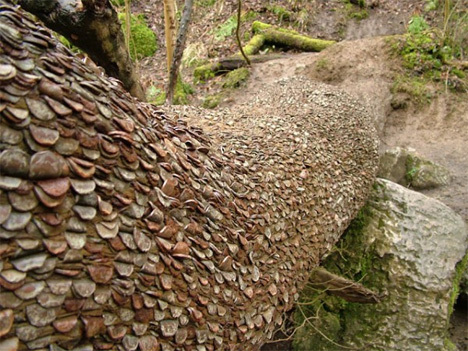 Or perhaps they are meant only to commemorate the existence of the former owners of the coins – like initials carved in a tree, a symbol that says “I was here.” Thankfully, most of the coins seem to have been driven into stumps or dead, fallen trees rather than still-growing ones. 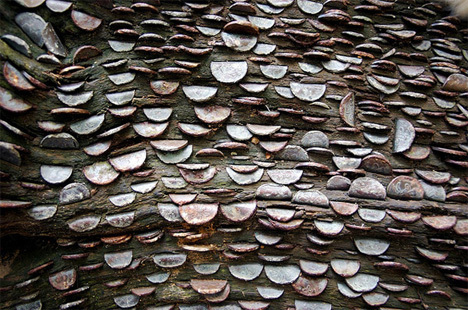 The manager of a holiday attraction in Gwynedd, Wales, did his own research on the coin tree phenomenon after visitors adorned a felled trunk with coins on his employer’s property. He claims that the practice dates all the way back to the 18th century, with one particular tree in Scotland bearing a florin. Whether or not these findings are accurate, the money trees are a fascinating tradition that appears to be confined only to Great Britain. Taking the coin trees at face value and nothing more, they are visually striking. 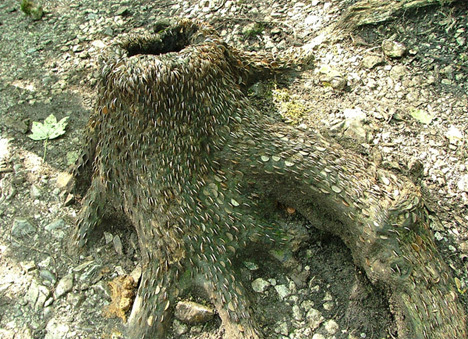 The coins look almost like a fascinating fungus or destructive parasites taking over the tree trunks. 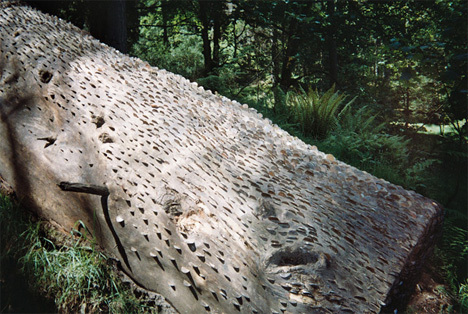 To think that each and every one of them was deliberately hammered into the hard wood by a person who had a reason for doing so – a reason that the rest of us may never know – is a compelling mystery.